From the founding of the Plymouth Colony in 1620, there had been continual trouble with the Indians. The Indians, you remember, were kind to the white men at first; but after the white men began to be cruel and hard to them, they, too, grew hard and cruel, and there seemed nothing too terrible for the Indians to do in revenge. The newcomers thought that these Indians had very strange ways of carrying on their battles. They never came out and met the enemy face to face in battle array, as the white men were then used to doing, but would skulk around behind trees, in swamps, or in the high grass. When the white men first used muskets and gunpowder, the Indians were terribly frightened; but it was not long before they, themselves, learned to use them. One day an old Indian chief begged some gunpowder from a white man and ran away to his wigwam with it. The white man watched to see what he would do with it. When he reached his wigwam, he called some of his friends about him and, after a long council together, they began to plant the powder. They thought it would grow like corn and beans. When an Indian killed a white man in battle, he always tried to tear off the skin from the top of the white man's head. These were called scalps. The more scalps he could get the braver he thought he was. After a battle he would show the scalps, with great pride, to the people of his village. These Indians were a very wandering people, never staying in one place very long at a time. When they made up their minds to move, the women would take down the tents, strap their babies onto their backs and trudge on the best they could, carrying, on their shoulders, the poles and household wares, the mats and the furs. The men would march on ahead, with nothing but their bows and arrows. Sometimes the poor women would sink under their heavy loads. Then the men would beat them and kick them until the poor things would rise and struggle on. When the Indians reached a place which looked pleasant for a camping ground, the men would throw themselves down upon the ground, in a sunny place, and lie there smoking and napping, while the women set up the tents and got the camps in order. The men treated the women like slaves. They expected them to do all the work, such as planting the corn, building the tents, carrying the baggage; while they did nothing but hunt and fish and smoke and fight. But, in reading of this life of the Indians, let us judge them not too harshly. They were cruel to the women and girl children, that is true; but it was because they knew no better rather than because they meant to be cruel. Remember they were rude, rough people, accustomed to war and to fighting. Surrounded on all sides by enemies, they grew to regard physical strength and skill in overcoming an enemy as the highest virtue in the world; and, consequently, they had come to look upon women as of very little account—good enough to do the cooking and the drudgery of wigwam life; but that was all. They had never learned that men and women, boys and girls, were to be judged and valued by something better and higher than mere brute force. "Good to squaw!" exclaimed an Indian in surprise, when one of the colonists had rebuked him for his treatment of his wife. "She no fight—no scalp!" and I suppose no argument could have convinced the Indian that he was wrong; or that, since she could neither fight nor scalp, it was worth while to make of her anything better than a slave or a servant. The Puritans, you will remember, landed at Plymouth one cold December day. A few Indians had been seen on the top of the hill when they first landed, but they had fled at the sight of the white men, and were not seen again for some time. Glad, indeed, were the white men that they did not again appear until they got their log cabins built, in which their wives and children might be safe from the arrows of these strange red men. Weeks passed by. At last, one morning in March, when the Puritans were holding a town meeting, in stalked a solitary Indian. The Puritans were not overjoyed to see him, you may be sure. They waited for him to speak. Solemnly he looked about upon them all, and then cried, "Welcome, Englishmen! Welcome, Englishmen!" These were indeed welcome words; for a minute before the white men had stood breathless, wondering whether this stranger was about to declare peace or war upon them. Samoset—for that was the name of this visitor—was a tall, straight man, with long black hair, and was arrayed in feathers and furs, and colored with bright paints, as was the custom of these savages. Samoset was so delighted with the manner in which the white men received him, that he speedily declared his intention of staying with them all night. The white men did not relish that; but, not daring to displease him, they made him comfortable for the night in one of the cabins, and kept watch over him until morning. At sunrise he was ready to return to his home, and the Puritans gladly bade him farewell. I am afraid Samoset hadn't very many ideas of what we call etiquette. He did not wait for the Puritans to return his call, but appeared again the very next day, bringing with him five other Indians. The Puritans were annoyed with this second visit; however, they gave them all food and drink, after which the six Indians danced and sang in a fashion peculiar to themselves. 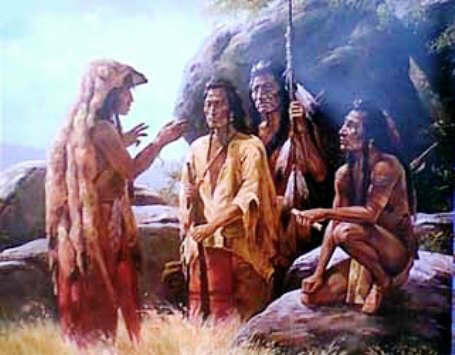 At night the five Indians went away, but Samoset had made up his mind to stay longer with his new friends. A few days later, seeing that he had no idea of going home, the Puritans sent him to find Massasoit, who, as Samoset had told them, was the chief of the Indian tribes in that neighborhood—the Wampanoags. Soon Massasoit, the chief, came, with sixty armed and painted warriors; terrible to look at in their feathers and paint. But Massasoit did not come to fight. He wanted peace between his tribe and the strange people. After a little talk, he sat down with John Carver, the Governor of this little colony, smoked the pipe of peace with him and promised to befriend the colony as long as he should live. This treaty he always kept, and, as he was a very powerful chief, the Puritans were safe from Indian attack as long as he lived. It was after his death that their real trouble with Indians began. South of the Plymouth Colony there lived a tribe of Indians who hated Massasoit's tribe. They also hated white men; therefore, you may know that when they learned that Massasoit was protecting these Puritans, they were doubly angry. For a long time they annoyed the colonists in little ways, but there had been no real trouble. At last, one day, there marched into the village a huge Indian, covered with his war paint, and carrying in his hand a long snake-skin. This skin he presented to William Bradford, who was now Governor of the colony, telling him that in the snake-skin was a bundle of arrows. "And what does that mean?" inquired Bradford. "War, war, war!" yelled the messenger. "Very well," said Bradford, calmly; "you may take this back to your chief." And as he spoke, he emptied the skin of its arrows and filled it full of shot and gunpowder. "This means," said Bradford, "that if your chief comes to us with arrows, we will come to him with gunpowder and shot." The messenger understood, and, snatching the skin, he ran out of the village to his home. There was no more trouble with that tribe of Indians. One day word came to the Puritans that Massasoit was dying, and that he wished to see the white men once more. Quickly, one of the Puritans, Edward Winslow, who knew considerable about medicine, hastened to Massasoit's home. He found the tent, in which Massasoit lay, so full of people that the sick man could hardly breathe. These Indians, both men and women, were howling and dancing around him, trying, so they said, to drive away the bad spirits which were giving him pain. This was a custom of theirs when an Indian was ill. If the sick man recovered, they believed it was because their noises had scared away the evil spirits; if he did not recover, it was because they had not made a noise great enough. When Winslow arrived, he set to work to do all he could to relieve the poor chief, who was suffering from high fever. In two or three days, Massasoit was quite well again. The Indians looked upon the cure as a miracle, and families came from miles and miles around to see the wonderful "medicine man." No one was more glad of Massasoit's recovery than the white man himself; for all knew that if Massasoit died the tribes of Indians on all sides would at once rush upon the white settlements, burn the houses, scalp the men, and carry away the women and children as captives. And this did happen within a very few years. After Massasoit's death, the Indians began to grow jealous of the increasing power of the white men. They were being gradually driven from all their hunting grounds. This story of Samoset and Massasoit is featured in the book entitled American History Stories, Vol. I. (Revised Edition), by Mara L. Pratt, Boston: Educational Publishing Company, 1908.